This listing is for a digital download. 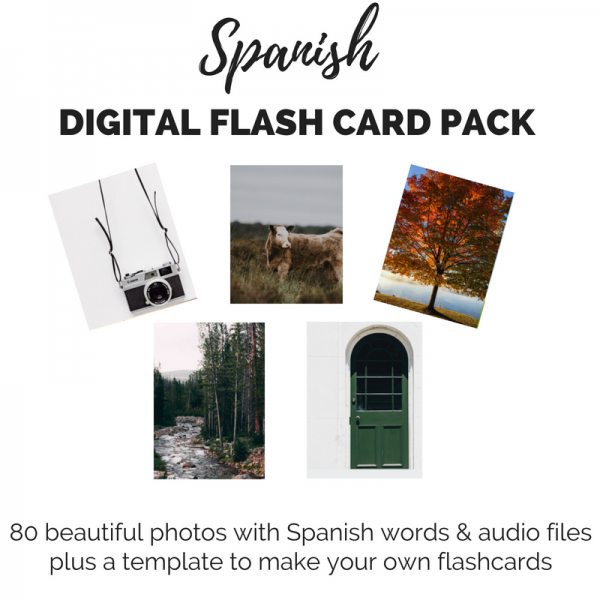 You will receive an email with a link to the PDF with the color photo flash cards, a PDF with the Spanish words, the audio files, the editable flashcard template, and a video tutorial to help you get started with making your own personalized flash cards. Note: You will need to print the flash cards. The file includes 20 pages of full color images (4 cards per page). This will use up a lot of ink! You will also need to print the words on the back of the cards. I recommend printing at home with a quality printer or at your local copy shop and then laminating the pages before cutting. The link to your Spanish Digital Flash Card Pack will be emailed to you. You will receive a payment confirmation email and a separate email containing the link from info@practicallyhippie.com. If you do not receive the link within 24 hours, please contact me.